That is all. I’m off to it, myself. Today is exciting for me, because the dragon in Dragonspire fully enters the story as a character in his own right! Nanowrimo Pep Talk – Six Steps to Success! Okay, crazy person. 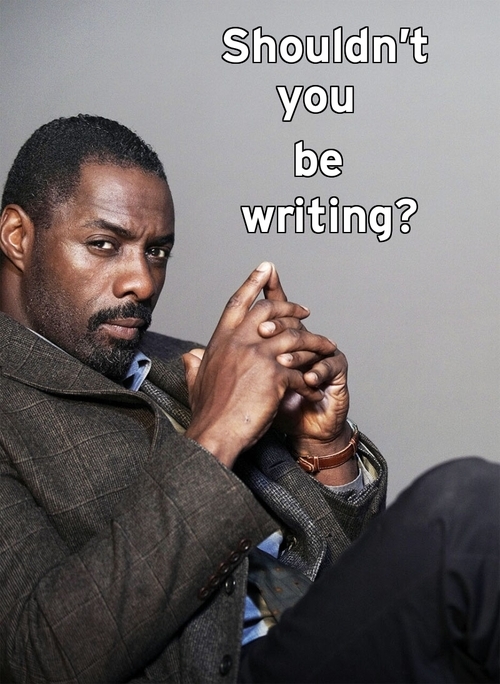 You’ve signed up for Nanowrimo. It’s too late to bemoan what the heck you were thinking. Now, it’s time to forge ahead, blaze your trail of glory, and join with that hallowed, elite class of individuals who have forged the path before you, said “YES WE CAN,” and wept like teething babies as they worked their fingers to bleeding nubs in the service of a higher power. The merciless writing muse, that is. There’s probably a mixed metaphor in there, somewhere, but I’m plowing onward with the story, as you will learn you must do during the harrowing trip that is the twisting path that will lead you through Nanowrimo. 50,000 words in thirty days. By this point, the goal may seem insurmountable. The reality of a largely blank manuscript has set in, you may be a bit behind the curve, and worse yet, the word counts of your peers may be depressing you all to hell. How do they do it? How will you do it? I’m here to tell you. There are six principles I’m going to touch on. Then it’s up to you to do the rest. My answer is simple and unvarying. When I have a word count goal, such as during a ‘Wrimo, I sit down, put myself in an environment isolated from any potential distractions, and reserve a block of time that is dedicated to writing, and only writing. For at least an hour and a half. During a normal work week, I bring my lil’ laptop to work and on my breaks and lunches, I sit down in the break room (bringing headphones as necessary to allay distractions or noise) and I sit down and write. This is step one. Sit down and make the time. If you can turn the internet off, turn it off! If you can put up a “keep away” sign, put that sucker up! Music, no music, isolation, crowded coffee shop – sit down for that dedicated block of time in the environment where you know you can be most productive. You don’t have time to re-read what you’ve written this month, tempting as it is. I speak from experience – down the path of re-reading lies madness. You will, inevitably, get caught up in either editing; or questioning yourself and the worth of every single word you’ve written thus far. DON’T STOP TO READ WHAT YOU ARE WRITING, FRIEND. IT IS A TRAP. You’ll have time for reading later. What I recommend for Nanowrimo is this: when you sit down to do your writing, in that budgeted me-time in the aforementioned step, open your file and read only enough of the preceding portion to get you jump-started in your writing. It’s okay to do other kinds of reading, of course. Technical papers. Homework. News. Other authors’ fictional works. Pep talks. But under no circumstances should you read your own writing during this month. I’d go so far as to extend that ban to any of your own writing, whether it’s the story you’re working on, or not. There’s no sense in poking the bear – in this case, the bear being that pesky little internal editor whose sole function in life, right now, will hold you back. If you’re reading this, I think it’s safe to say that you’ve already halfway accomplished this step. Some people gain strength through competition, and comparing their performance to others’. Some people function better when they partner up to trade words of encouragement and to share the load. No matter how social or hermetically-inclined you are, buddying up during the month of Nanowrimo will help you to achieve your goals. But, simply signing up for Nanowrimo is only half the journey. Make sure to participate in some of the opportunities the site is offering! Checking in daily with your word count, no matter how big or small, will help you keep moving forward, which is what this month is all about. Dropping in on a forum thread or two can help you with word wars, write or die exercises, and simply the opportunity to network and brainstorm with other writers. Need to know what kind of car wrecks could cause traumatic amnesia? Questions about governmental procedure on inheritance? Tap into your writing group. You may be surprised at the answers you’ll find. Best yet, turn to the community when you’re feeling high or low. We’d love to share your successes with you. And we’re only too happy to lend an ear, or offer advice if you want it, when you’re feeling like the whole thing is overwhelming on top of life, which doesn’t seem to stop moving when you most want it to. No one writes in a vacuum, and we’re here to help. So, 50,000 words, huh? Seems like a lot. It might seem impossible. Enormous. An unyielding, insurmountable task. Sitting down to do 1,667 words all at one go may still seem like a difficult hurdle. It’s often easier to accomplish tasks when you break them down into smaller chunks. So, let’s sit down to do a word sprint in the morning. During that time you would normally sit and go through your newsfeeds over coffee, or read your LJ or Tumblr or whatever other activity, set it aside for writing instead. Do a word sprint. Whatever seems reasonable for that block of time, set your goal. Now you can mark off 300 words for the morning! Or 500, or 130, or 777. Whatever you’ve written in that word sprint, that’s your start for the day. Sit down later in the day with more dedicated time. Don’t read, and don’t try to think too hard about what you’re writing. Sit down, visualize your scene, and pour yourself into the act of putting one word after the other. Pretend that it’s write or die, and if you sit thinking too long about your next word, your doc file will start erasing what you’ve got down there already. Better yet, go to a site like the actual http://writeordie.com/ or to http://writtenkitten.net/ for incentive. All right! More words! Add them to your total and keep going. Put one word in front of the other until you reach your goal. Make use of that “me” time, sit down, and march those words toward the 1,667-word daily finish line. Make sure the people in your life know what you’re doing this month, or you will drive them crazy, and probably yourself as well. Your support network can be literal, in person; or it can be figurative. Your support network is the vital lifeline who will cook for you, or pick up a few extra chores for you, or say “tay, why don’t we order a pizza so we can write instead of cooking?” Oh wait – that’s my house. When your support network knows you’ve signed up for this project, they can help cheer you on. They can remind you to take that “me” time you need to budget every day – or stay out of your space and respect the fact you’re taking it. They can remind you to take breaks, lest you gnaw your own arm off because it’s been that long since your last meal. Check in with friends or family both to keep you on course, and so they can help you take sanity breaks. The road to 50,000 words is paved with loved ones making your path smoother. Well, optimally. You can also check in with your support network to let ’em know they’ve got to stay the hell out of your way. A P.S. To your family/friend/roommate/spouse: feed the cat; see you in December. Toot your own horn. OFTEN. This is like your battle cry. Did you get two hundred words done when you sat down for a writing sprint or a break? This is AWESOME! Cry to the masses, “WOOHOO!” Tweet about those 200 words like you are the first person to ever accomplish this! Each milestone is important, and it matters. It matters because it gets you pumped. There will be days, and times, during this month when you feel like a failure. (Or maybe not, but then you’re one of those lucky exceptions.) So it’s your job, and ours too, to celebrate each thing you achieve and encourage you to stay at the top of your game! This is not a month for focusing on what you haven’t done. This is 100% completely and totally the month for celebrating what you have done, are doing, and continue to do. And I encourage you to glory in the accomplishment of each and every day. You ROCK Nanowrimo, don’t ever forget it! And we are so proud of you!